Another fluid and dramatic piece that flows like a dream on any figure! It's hand woven and dyed in Morocco, the yummiest sousde cotton/rayon blend that feels as soft and luxurious as a kitten... can anthing be more delicious? 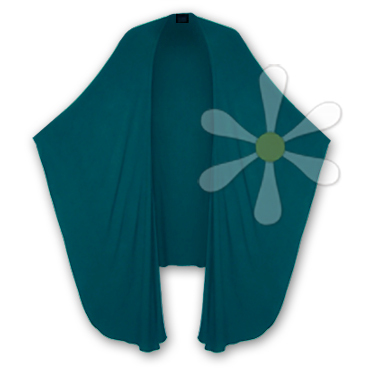 The handmade quality of this free size shawl is absolutely superior, which you'll recognize immediately when you see the detailed craftsmanship. You can save it to wear to special events�it's perfectly elegant with the right outfit�but it's so scrumptious, you'll find ways to dress it down to wear more often! It's as perfect for cool summer evenings as it is cozy for cold winter nights�in other words, a truly versatile must-have for your susdi collection.